My painting mentor employs an intriguingly effective way of pulling out her students’ inner wisdom. 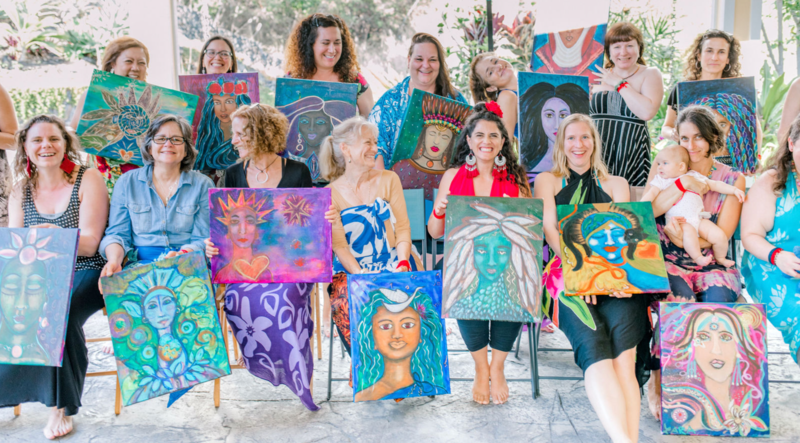 That access to insight – more than learning to paint – is the point of Amber Bonnici’s painting retreats, called Women Unleashed. A recent painting excursion led me to start a curious experiment of self-understanding. I had been furiously working on our Taking Back Your Health manual for 23 days to have it ready for the opening session. At 10 pm on the Friday night before our health program was to start on that next Monday… Voilà! We finished the manual and I picked up a beautiful test copy from the printer’s. Woohoo! Amber’s painting retreat (womanunleashed.com) was starting the next day, Amber had kindly reserved a “just-in-case” spot for me and I just knew I would tap into something important on this trip. 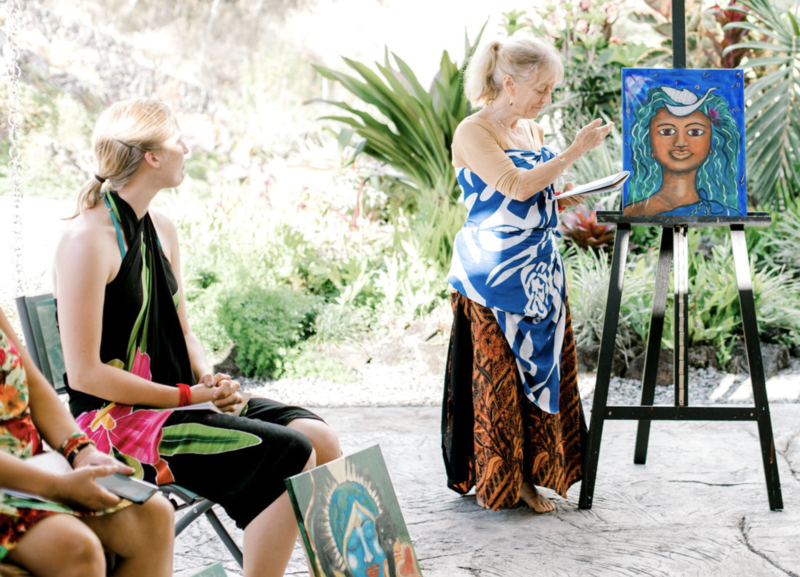 I awoke at 4 am the next morning and flew to Kona, eager for my next painting journey. (Some of you may remember my painting story connected with our fish named Kwan Yin. Read it here). Amber begins our painting sessions by taking us on a journey of imagination: down some stairs, through a meadow, into a forest, entering a cave, opening the door and finding our inner wise woman. When we meet our inner sage, we notice everything about her, including the look in her eyes, what she’s wearing, her stature. She gives us a warm embrace, and we have the opportunity to ask her a deeply held question before we leave our meditative journey. 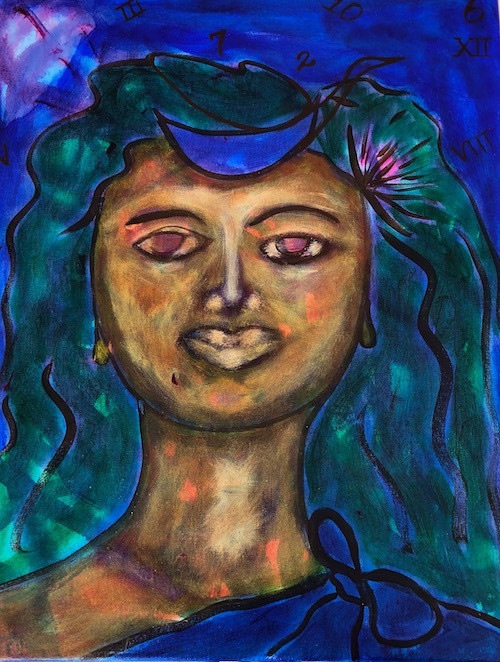 This time, my wise one appears to me as the young Hawaiian goddess Hi’iaka, symbolizing the power of regeneration, wearing a lehua blossom from the fire-following tree that grows up out of black lava fields. Appropriate! She stands in a lava-tube cave, with moonlight flooding through a gaping hole in the cave’s ceiling. Her face is round and full. 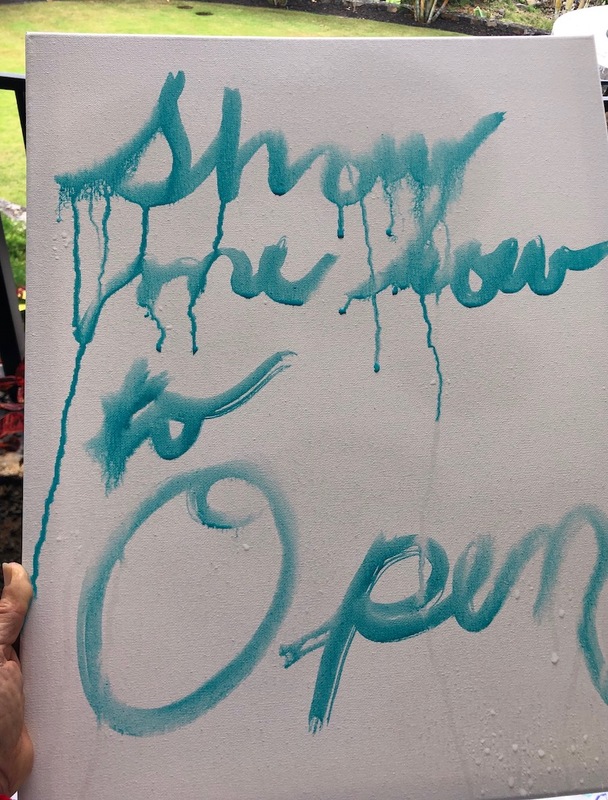 Amber instructs us to approach our canvas respectfully, spraying it with our water bottle to “awaken” and “bless” it, then writing our question on the blank surface to underlie our later painting. 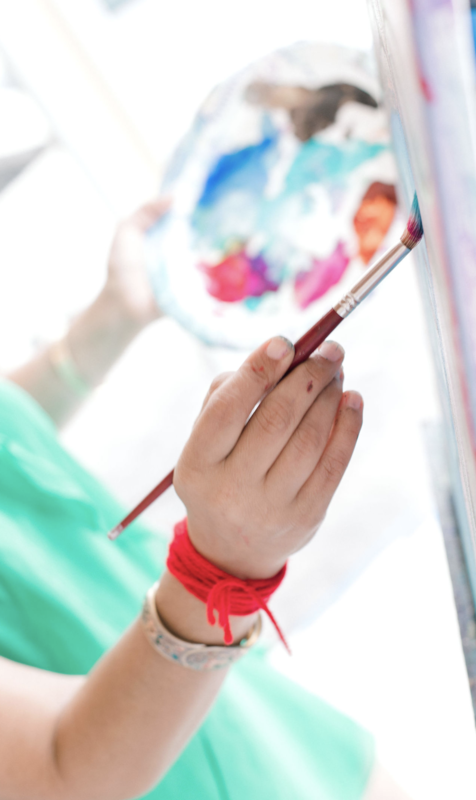 Then Amber deftly leads us through the painting process itself, always surprising those of us who are untrained artists with our unknown ability to produce a painting that actually resembles a human being! 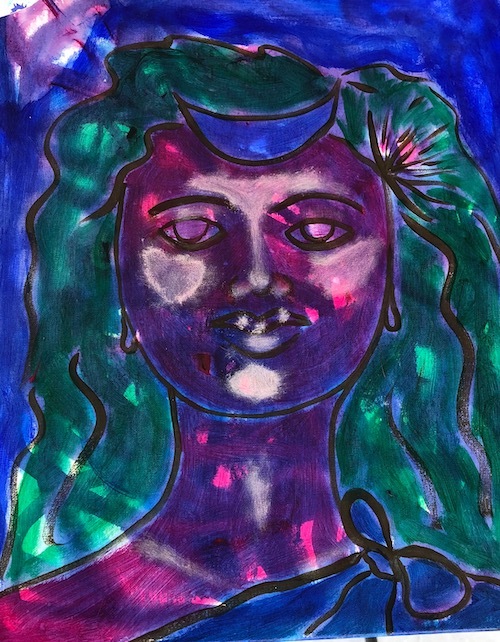 Soon fantastical women begin appearing on everyone’s canvases, some with green skin, or lavender hair, yet definitely human in proportions, all straight out of our imaginations. On the second day of the retreat, Amber again takes us on a meditation to meet our inner sage, and this time to receive “gifts” that may symbolically answer the question behind each of our paintings. I receive a white swan soaring aloft, a pocket watch, and silver threads. All of these manage to make it into my painting. Amber suggests over and over that we consult our ladies each step of the way to see what THEY want: hair color, ornaments, surroundings, and so on. I do my best to “listen” to my painting. 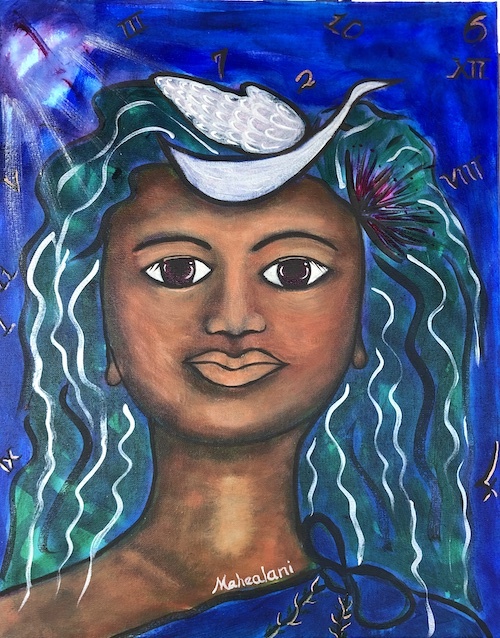 She (my painting) tells me to turn the crescent moon already painted onto her forehead into a flying swan, representing the ability to fly above pain – like that which I experienced in childbirth. Silver threads of moonlight shine through her hair, suggesting the more feminine aspects of her/my nature than the solar gold that I always wear. Not the pocket watch itself, but its numerals appear in the night sky, flying off into insignificance, as the healer comes fully centered in the present moment and time dissipates. “Oh, OK, I don’t know what that means, but your name is Mahealani,” and I write it in silver like a tattoo near her collar bone. Then I look up the Hawaiian word mahealani: it means “heavenly moonlight.” Of course! 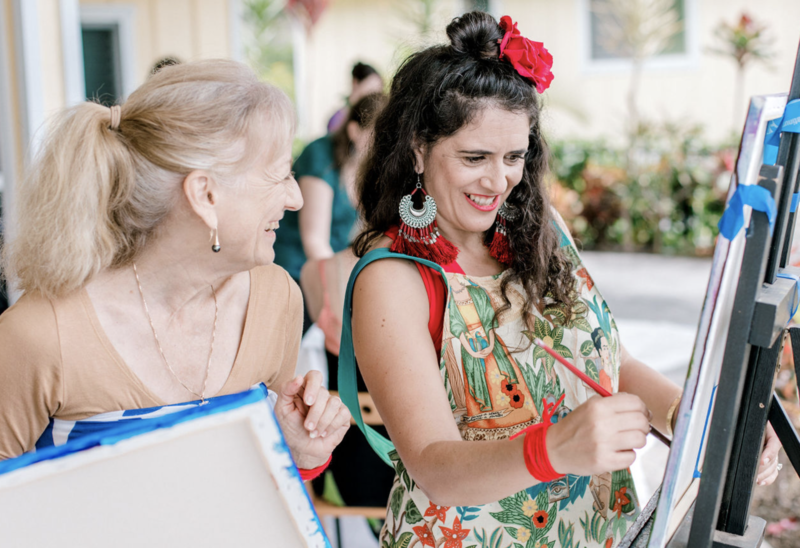 Her teaching to me has to do with awakening the softer, lunar, receptive side of my nature – balancing the bright active, take-charge, solar side. She tells me: “Know what you know. Know what you don’t know,” counseling me in both the confidence and humility that a healer needs. I thank Mahealani, and take her back home, grateful for what I’ve learned about my inner healer. The next day our Taking Back Your Health program starts, five new Vitality Team members showing up with shining eyes of anticipation, first-day-of-kindergarten-like eyes. As a key to the entire program, we talk about how to really LISTEN to our bodies for better health. These bodies we inhabit are amazing, complex instruments, and they come with their own operating manuals. The language our body speaks is sensation. So when we listen to all the signals our body is continually sending us through our ‘ouches’, and our ‘Ah, that feels good’, and our ‘I need to use the restroom’ signals – all of those sensations are the body telling us how it wants to be operated and taken care of. We’re in our Vitality Team meeting the next day, and my inner healer Mahealani is evidently prompting me. 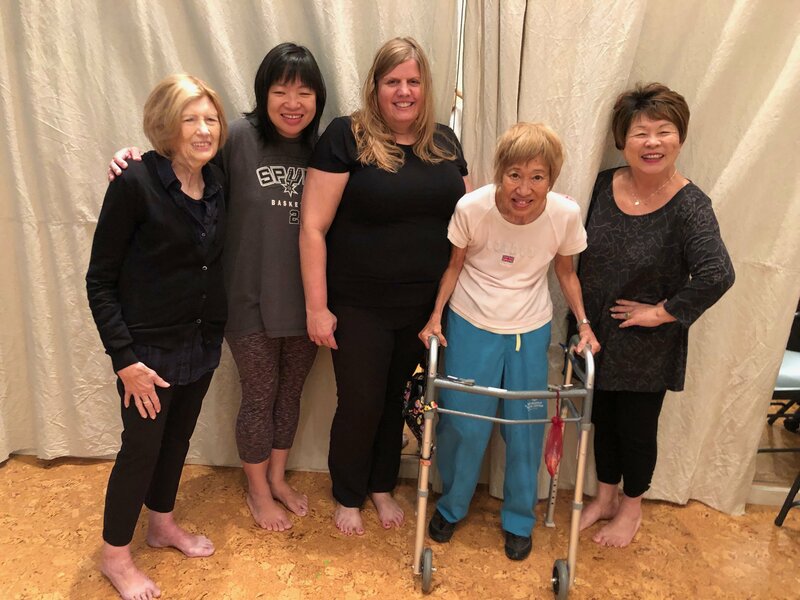 I hear myself saying to the group, “OK everyone, we really want to start listening more closely to our bodies so that we can take better care of them. Here’s what we’re going to do: Each of us is going to find a NAME for our body. Just your own body’s name.” Oh boy, did the eyebrows go up with that suggestion. That’s our new experiment! Will we listen more attentively to our bodies, and even ask our bodies questions, once we give our bodies names? Will our bodies talk as much as my painting does? Mine does already since I communicate with it all the time. Let’s see what adding a name might do….! Just hit reply – I always love hearing from you.